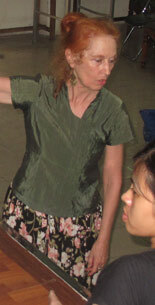 Catherine Diamond has been directing theatre productions and studying Asian theatre for over twenty years. She is a professor of theatre and ecological literature at Soochow University in Taipei. She is the author of Communities of Imagination: Contemporary Southeast Asian Theatres (2012), and Sringara Tales (1996), a collection of short stories about Asian dancers. She has participated in Bread and Puppet Theatre projects dealing with environmental problems and was formerly the director of the English-language Phoenix Theatre in Taipei. She initiated KETEP to contribute to the rich folkloric traditions of Southeast Asia and to promote environmental protection awareness as a source for new dramatic writing.